The Labor Day weekend has come and gone, the kids are back in school and the leaves are beginning to change colors "Back East". The Napa Valley has a different rhythm to the seasons. It may be fall be we call it harvest or better yet "crush". Crush is a noun, a verb and an adjective a time of year when the hard work put forth in the vineyards has an opportunity to shine. One of our favorite troubadours, Jimmy Buffett, sums it up well in his song "When the Coast is Clear"
They'are shuttin' off the "superslide"
It's the perfect time of year to slow down, reflect a bit and give yourself a respite from a world that seems to spin faster as the years go by. The first weekend after Labor Day is the perfect time to begin enjoying the change of seasons with us in Calistoga. The third annual Calistoga Wine Experience occurs on Saturday, September 8, 2018, the day before Calistoga Harvest Table. 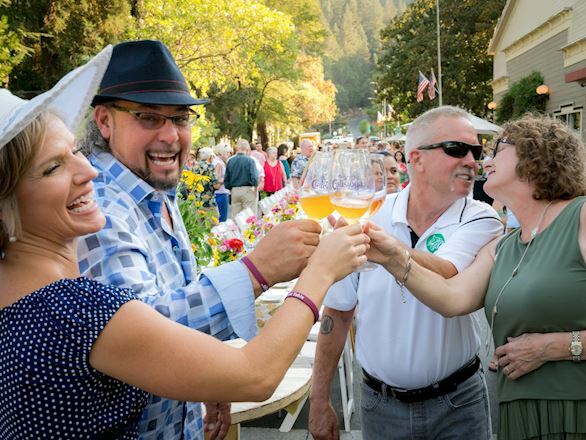 Enjoy wine tastings with owners and winemakers from over 40 Calistoga AVA wineries. Pair varietals with gourmet bites from local chefs and listen to live music in Pioneer Park from 4:00 - 7:00 pm. Hosted by Calistoga Winegrowers. On Sunday September 9th is Calistoga Harvest Table®. Tickets for the event are sold out. If you were not able to secure tickets, we encourage you to come downtown on the day of the event and enjoy a glass of wine from one of the eight event bars while you mix and mingle! To stay updated on Calistoga Harvest Table® 2019 go to Visit Calistoga and sign up for their newsletter.